Spanish Chicken is a great new way to serve up flavourful chicken rather than grilling, baking or stir-frying. The best part, you only need one pot! You can use chicken in thousands of recipes but for most people they stick to the recipes that sound delicious and that don’t take hours to prepare and cook. We all like a go-to recipe that is affordable not to mention quick and easy. This is a meal you want to add to that list. It’s always nice to try something new to break the food boredom trap that many people fall into. To make life easier in the kitchen I do cheat now and again to get a meal on the table. What do I mean by cheating a recipe? Well, not everything is homemade. Although I do my best to make all of our meals from scratch the reality is today’s parents don’t have the time to do it all. We don’t all want to be chained to the stove 24/7 so sneaking in something pre-made now and again is not a bad thing. In this recipe my cheat is the pasta sauce. I ran out about a month ago of my homemade canned pasta sauce which I make every year with garden fresh tomatoes and herbs that I had to use a jar sauce that I bought on sale at the grocery store. I usually buy a big jar as back-up so that I can keep it in the fridge once opened and use for other meals during the week. I also know how many jars I need to make each year based on how fast we eat through the stockpile. I also have a great herb garden that’s not long been planted so that I have fresh herbs on hand during the summer months. If you are like Mr. CBB and plant tonnes of parsley, chives and basil you can make his Basil Cubes and use them all year-long in your cooking. It’s a great way to flavour your meals with garden fresh herbs but in the winter. Hopefully next year I will have the garlic come in our garden in abundance. Speaking of garlic, I did buy a huge bag of ready peeled garlic which is convenient if you don’t have the time to peel it. Although there is no way I am going to get through all the garlic I got out my ice-cube tray, crushed the garlic and mixed with a little olive oil and froze it. Once it was frozen I popped them out and put them into freezer bags just like Mr. CBB does with his garden fresh herbs although he uses muffin tins to freeze his herbs. Now I have another cheat ready to go when I need garlic in a recipe. You can use butter in place of the olive oil as well. This is just another example of how I save time and money in the kitchen. For this Spanish chicken dish I wanted to make sure the flavours were dominant as it’s so important especially when using a sauce. We enjoy chicken wings prepared different ways, from deep-fried to coated in BBQ sauce or even a hot sauce. Why not use the whole chicken in a one pot stove dish? 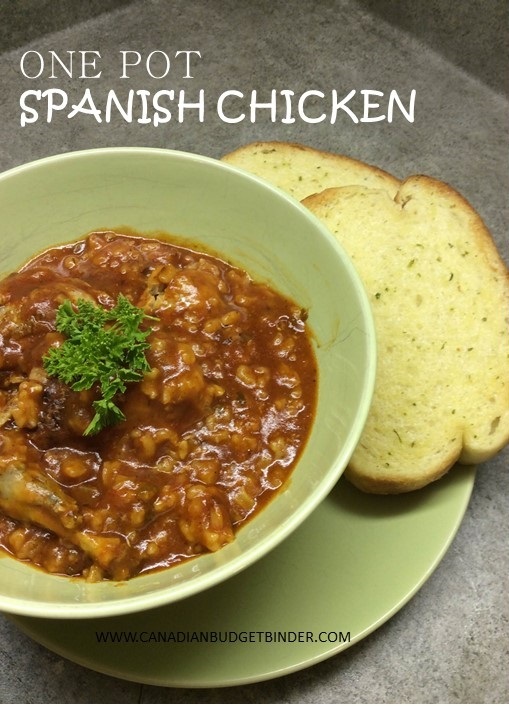 Using the entire bird in this one pot Spanish Chicken recipe rather than just the breasts, thighs or wings will add plenty of taste. Either way the cooking process in the sauce will allow the meat to just melt off the bone when it’s done. If you don’t want to use the entire bird you can use just the wings and thighs. It’s up to you. I added Italian short-grain Arborio rice to the sauce which will soak up the flavours surrounding the chicken and sauce to create a full meal. The kick in this recipe is the paprika a spice that is red but not too hot or not too mild depending on what type of paprika you have on hand. This wonderful light spice just gives enough tang to the dish without it being overpowering for your taste-buds. The origins for this spice are unsure as it’s used a lot all over the world from European destinations like Hungary and Spain to Mexican and Indian dishes. I like to serve my Spanish Chicken with a side salad and garlic bread to soak up all of that gorgeous sauce. What are some of your favourite Spanish meals or dishes? If you are a lover of chicken wings or just chicken you will enjoy the spices that permeate the meat like we've done today. Rub paprika all over the chicken until coated evenly. Place olive oil in the pan and wait until hot then add chicken. Now add the rice and mix lightly with the chicken, then add the pasta sauce and chicken stock. Cover and turn down the heat to a simmer for an hour. Occasionally you will have to go and stir to ensure rice doesn't stick to the bottom of the pan. If you find the rice has absorbed all the liquid, and it is still hard just add a little more water. Just before serving mix in the herbs. There you have it a flavourful frugal dish that is perfect for any grocery budget and perfect for a large family meal or many small meals throughout the week. I am having this for dinner later. My mom is gonna cook this. When I shared the recipe with her, she was amazed and so excited to try this new recipe. Nicola, you never fail to impress us with your recipes! Let me know what you think! It’s one of my easiest recipes that is truly yummy! Christine I use whatever is handy for my herbs you mix up your favourites. Grated ved would really bulk it out and make it even tastier! Looks yummy!!! Bet I could chop fine or grate some veggies in there too to get past a fussy husband!! What herbs do you use for the cup of herbs or is it what ever is handy?? Thanks for another delicious recipe Nicola!! !